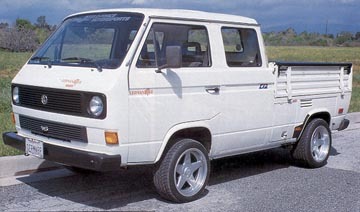 This page is dedicated to those who own Volkswagen Crewcabs or enjoy Volkswagen Crewcabs. It doesn't matter if your Crewcab is falling apart or garaged. All Crewcabs are the same, rare and fun!!!! HINT--- If you minimize the Tripod advertisment window (not close it) and go about with your business through this page, it won't be as annoying, and it'll stay minimized. E-mail me a picture of your Crewcab in JPEG format and give me a good discription on how you came upon it and the specs (enigine size, new parts, etc.). If you don't have a scanner, snail mail it to me, and I'll scan it for you. OR, if you already have a page for your Crewcab, send me the URL, and I'll add a link to it. 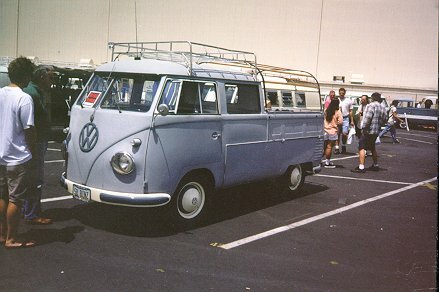 Want to find what your 67-79 Type 2 originally came from the factory with? Erik Meltzer and Vincent Molenaar have created a list of M-codes for late model Buses listing almost all the original accessories that your Type 2 came with. From exterior paint color, all the way down to the Eberspacher gas heater. You can find this site by clicking here. Updated as of October 25, 1999. Keep checking back, I hope to update every 4 weeks! Have any suggestions about this site or find any problems? Feel free to e-mail them me! Take a look at the product pull down box. There is some pretty neat info there. If you know of any products that you would like to see, please e-mail me the URL's. Come take a look at some of these Crewcabs!!! Select a member's Crewcab page!!! David McCudden's Crewcab Scott's Crewcab Craig's Crewcab Randy's Crewcab and Page Gerald's Crewcab and Page David's VW Page and Crewcab Jeremy's page and Crewcab John Spohn's 1970 Crewcab Stephen's Crewcab Sean's 1975 Nato Crewcab Gaz's Crewcab Carl Albutt's Crewcab Michael J. Vickey's page Ty Graham's Crewcab Mike Miller's Syncro Larry Devore's Crewcab Tom Carrington's '85 Crewcab Vincent Jura's '71 Crewcab Claude Lapierre's '88 Syncro Your Crewcab could be here, contact me on details!!! Need some product information, try one of these sites!